These three exhibition portrait series showed between 1999 and 2003. 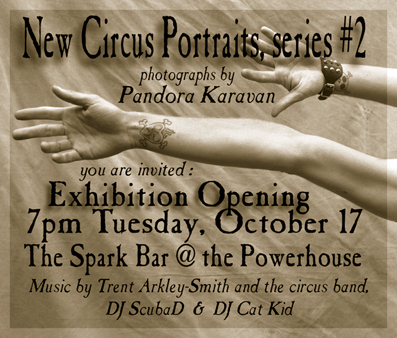 The performers depicted in these series are workers in the Australian New Circus industry. The pictures were taken on black and white film using an old manual camera. They were taken candidly often with the black of the inside of the circus tent as the backdrop. The exhibitions have hung in the Brisbane Powerhouse, The Queensland Performing Arts Centre and various other venues. What is 'New Circus' I hear you ask? 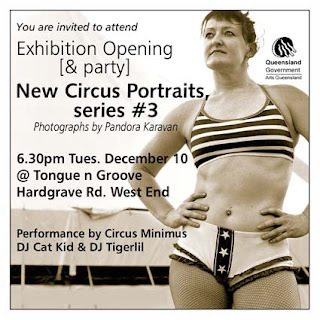 'New Circus' is distinct from 'traditional' circus being a modern, more theatrical form of circus.Well known companies include Circus Oz in Melbourne, Circa in Brisbane and Bizircus in Perth. There are many smaller troupes, and New Circus as a genre also encompasses some street, sideshow & cabaret performers. Pandora Karavan’s images erupt from their frames and belt you in the eye. They capture the tortured contours of the contemporary circus - its desperate striving for cool, its celebration of difference, its paean to the possibilities of the human body in extremis and its reclamation of grace from within the boundaries of the pretension. Karavan’s images exist at the same rock face. They harangue the very boundaries of what art is meant to be. Photography can be the most transparent of media. The photos that haunt us from the ubiquitous coffee table ‘books of the century’ are pretty much literal representations of their subjects. The art is hidden, or, if not, is subsumed by the iconic power of the image itself. Circus is the opposite of this- a celebration of the contingent, the passing, the death defying. And to defy death one must surely be in the present. Contemporary circus combines this with an attempt to excavate the Zeitgeist itself. One can hardly move in it for the welter of images of splayed psyches, sadomasochism, funky phat beats and hot bodies. And Karavan is clever enough not to try and answer that question. Rather she provides a craftily uninflected surface for the inner workings of her subject neuroses to perform their acts upon. And they are most successful at this point of the stare off. Rita Van Opzeeland’s wanna-be freckled punk whose vulnerability is as prominent as her sequins or the precise hang of the curtains around the impish homelessness of Trent Arkley-Smith’s cello hanging emergence from the tent are small masterpieces of insight. You can almost feel the act, the need behind the act and the pathos of the wanting that each performer carries with them like an albatross. Perhaps less successful are the action shots. Rudy Mineur and Mark Sands’s physically astonishing high hand to hand or Annie Stephens and Paras Christou’s high swan are well constructed and distinguished by a detailed use of colour and texture. But they simply can’t compete with the emotional audacity of Karavan’s periscope into the essence of the performers’ fragile egos. Lucky Rich stares you down with his tats, his mirrored contact lenses and his get fucked attitude. Karavan beats him at his own game. You understand where he is coming from but ultimately you sense the frightened rabbit inside the wolf’s coat. And on the mock glamour of Chelsea McGuffin’s Sandy Pit and the desert dry parchment of Tony Rooke’s chin are printed the words ‘I want you to love me and this crazy thing I do”. Ultimately these are deeply romantic images cast for a suspicious age. They do not triumph their insight, they do not betray their subject. Rather they lovingly embrace them, with all their anxieties and imperfections. And in the process make true art. If this sounds like a hagiography rather than a review I’ll state my credentials. I am artistic director of Rock’n’Roll Circus. And I’ve spent five hundred bucks buying two of these pictures. I urge you to do the same.